My dad’s side of the family is Italian, but when you ask my grandmother which part of Italy her family is from, she’ll say, “Brooklyn.” So even though a lot of our traditions and foods were rooted in the old country, they’re not necessarily traditional. One thing Grandma has always insisted on, though, is real Italian cheese. “Trust the experts!” she’d say. She’d make the biggest feasts for our big family for even the smallest occasions, her entire dining room table covered in scratch made dishes. She used only the freshest, best ingredients for her family. We’d eat and eat and eat to our heart’s content. Those were the good old days, for sure. I still love italian food, but nowadays I try my best to eat seasonally and usually, gluten free. I don’t make the big spreads like she did either (how did she have all the energy? ), but I did learn one important lesson from Grams – source the best ingredients for your food. 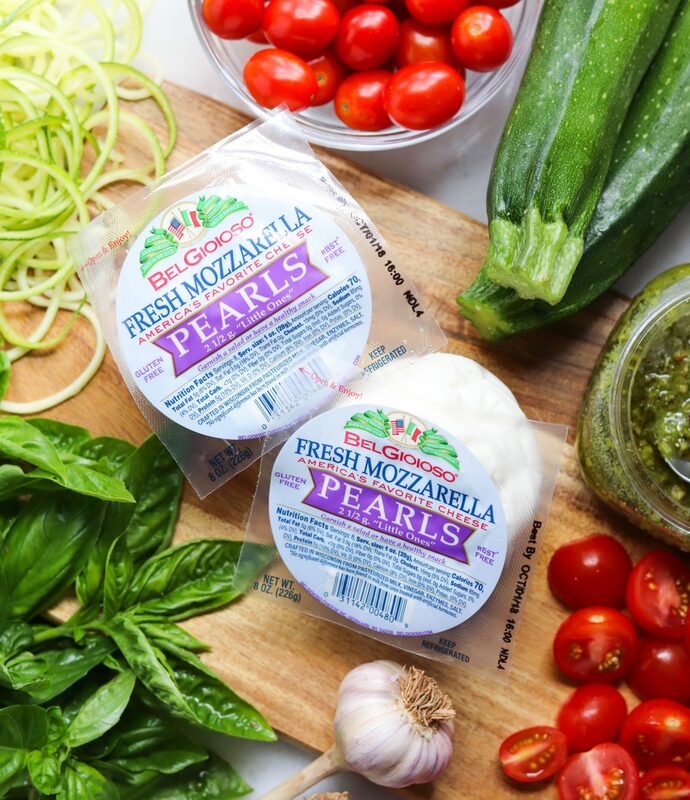 I used tomatoes, herbs, and zucchini from my own backyard and BelGioioso Fresh Mozzarella Pearls for this simple, fresh, and delicious dish. 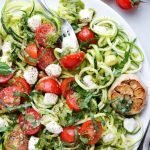 A simple and flavorful gluten free & vegetarian dish, made using fresh mozzarella cheese, spiralized zucchini, garden tomatoes, pesto, and roasted garlic. Cut the top ½ inch off of each head of garlic, exposing all of the cloves. If there are any brown parts, slice them off and remove. Set the garlic in a small oven-safe dish, drizzle with olive oil, and sprinkle with salt. Cover the dish tightly with tin foil and bake for an hour. Remove from the oven, allow to cool slightly, and while still warm, gently squeeze the cloves out. Wash the tomatoes and slice them in half. Set aside. Choose small zucchini (large ones are too seedy). Wash and cut the tops off. Spiralize using the smallest setting, then roughly chop any ribbons that are very long. Set aside. 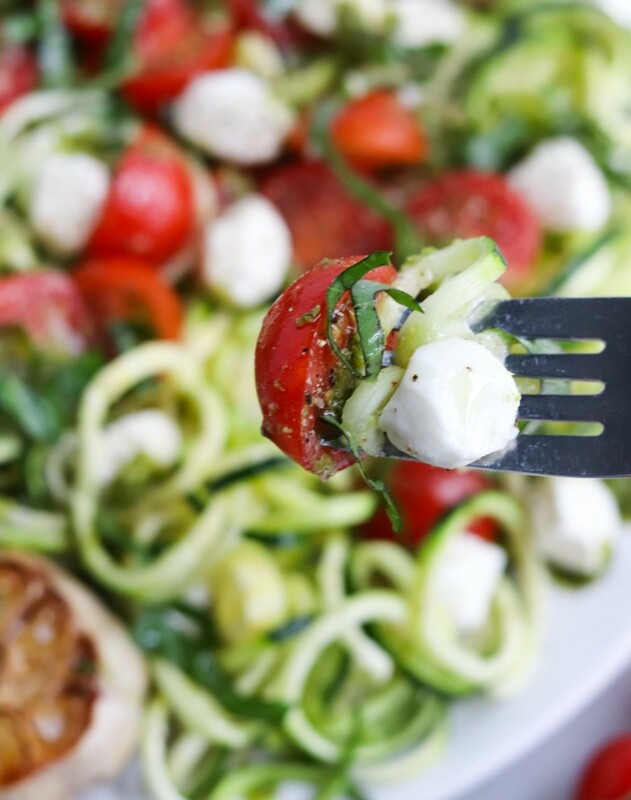 Arrange the zucchini noodles on a large plate with the cloves of roasted garlic. 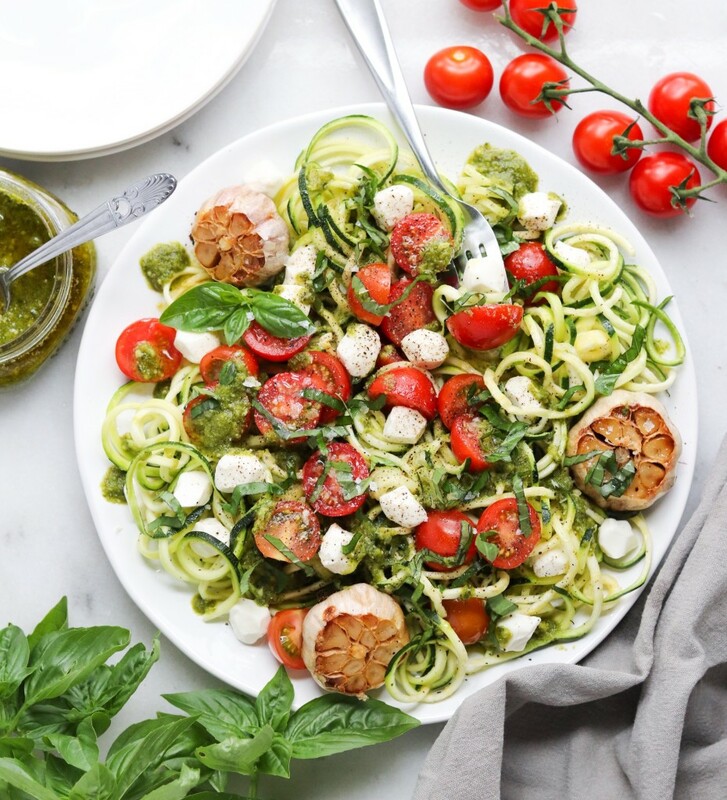 Drizzle half of the pesto on the zucchini and gently toss to coat. 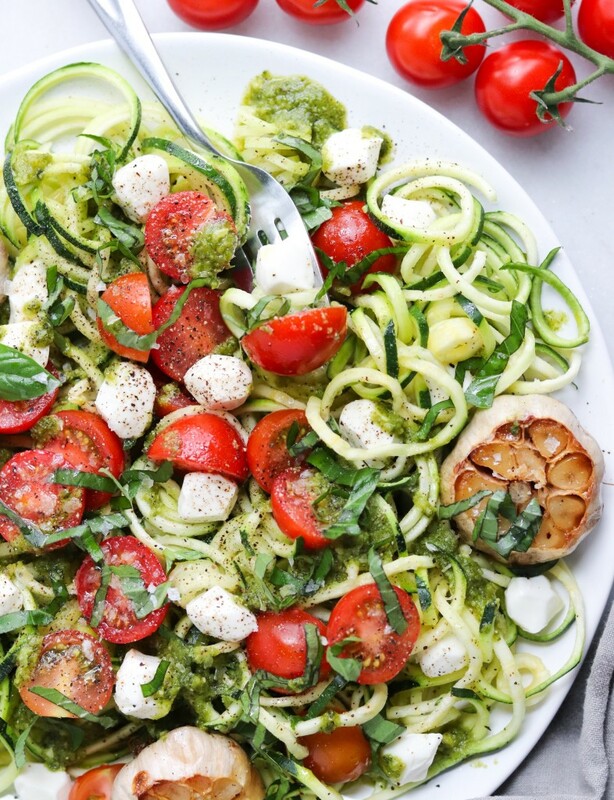 Arrange the tomatoes and mozzarella pearls on top and drizzle with the rest of the pesto. Season with salt and pepper to taste and garnish with torn basil leaves. What’s your favorite summertime meal to make? Let me know in the comments below!